The first thing you must do when choosing an stability ball / exercise ball or sitting ball is, to find the right size for you. This depends mainly on your height, but you must also take into consideration whether you have long legs or long body within the overall height. Sit on the ball firmly and note the bends at hips and knees. Your hips should be level or slightly higher than your knees. This means that both will be bent to 90 degree with your thighs parallel with the floor. 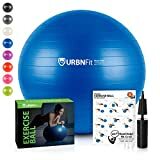 It may be that you will feel more comfortable exercising with a slightly larger exercise ball. This is fine. Just don’t get one that is too small as it will not offer enough stability. To determine the size of your excersice ball, measure your height by using a measuring tape. Enter the value into the calculator (in centimeters). Alternatively, you can also use the following table to determine the ball size. Your height is 5’0″ (153 centimeters). Now use the table to determine the your personal ball size. In this example it’s a 22 in ball (55 centimeters). You have to measure from the floor up to the middle of your kneecap.Then add 4 inch (10 centimeters). This is made because the ball becomes smaller if you sitting on the ball. Our calculator considers these 4 inch (10 centimeters). This means, the displayed size have to be bought. Otherwise you cann look in our table. Look at the corresponding value in the column heigth (your height) an you see your ball size. Your leg up to the center of your knee is 19.7 inch (50 centimeters). Now look in the table and you land in the category 18.5 – 22.4 inch (48 – 57 centimeters). In the column “Ball Size” you can see the correct ball size of 26 inch (65 centimeters). These are general guidelines. Don’t forget to take into account whether you have long or short legs for height. If you have back problems it may be better to have larger ball. Size of ball and firmness depends on what you want it for – stretching, weight training, yoga, Pilates or just to use as a chair. If you want a soft rather than firm ball choose the larger size. Worried that you are overweight/obese? Burst resistant balls are made to hold 600 or more pounds. So look into this aspect too if need be when choosing an exercise ball. Is the ball size fixed? If you have found the right size for you, you can look for your sitting and / or gymnastics ball. There are the sitting and gymnastics balls in different colors and with different surfaces. In addition to size and color, quality is also important. A cheap ball can burst quickly. If a “simple” gymnastics ball or sitting ball hits a pointed object or is overloaded, it bursts with a loud bang. If, on the other hand, it is a gymnastics ball made of ABS, it loses its air very slowly, but does not burrow. This ensures the necessary safety. The TOGU Powerball series has an ABS® anti-burst system. The following video shows the operation of this system.